Choosing a wedding dress is a joyful part of the wedding planning. There are so many to choose from so where do you start? We are specialists in tea length wedding dresses and can help you find the perfect one. The joy of tea length wedding dresses with a 1950s style skirt is that it moves so beautifully. The spin is breathtaking and the gowns are so versatile you can wear them whatever the style of wedding. Below are a sample of some of our tea length wedding dresses with a 1950s style skirt. We have so many more at our Bexley Wedding Boutique where we’d love to meet you. Flossie by Loulou Bridal is a tea length vintage inspired lace and tulle gown. This Ivory short wedding dress features an off the shoulder lace bodice. The tulle full skirt is finished with a satin bow belt. Loulou bridal gowns are available in a range of beautiful colours including ‘ash rose, blue’ baby pink, mocha, vanilla, grey and more by special request. Rita Mae is a British Designer Wedding Dress Label part of the Alan Hannah Group. Available in ivory and white and some designs are now available in a range of beautiful colours including almond, gold & Champagne. 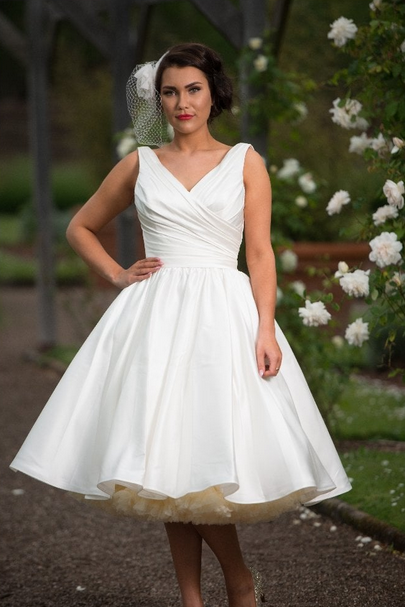 The beautiful fitted bodice on this dress gives way to a full retro style wedding skirt. It has a gorgeous embellished finish and a sparkly belt for good measure. This is a statement wedding dress that you will want to wear. Betsy by Timeless Chic is a stunning sating vintage inspired wedding dress. The gathered bodice and cross over front detail makes this a very flattering choice. We also have this short wedding gown available in calf length and you can have it altered to any length in between too. These tea length wedding dresses with a 1950s style skirt can be accentuated by lovely layers of petticoats for more volume. This is a great retro look to go for and exclusive to our boutique. Timeless Chic is our in-house designer collection of short wedding dress designs that have a modern twist. Need more inspiration then visit our real brides over on our blog. Why not visit our Pinterest Boards for all things wedding. Or book an appointment to try one of our gorgeous tea length wedding dresses with a 1950s style skirt. Your appointment will be one to one where we will find out what you are looking for in a tea length wedding gown. You’ll then be able to try as many gowns as you would like from our range of over 150 designer short wedding dresses.